That is how a 9 year old boy introduced himself to me – ‘Hello I’m David and I have ADHD.’ My immediate response was, ‘Wow! You’re probably going to be very rich and famous one day!’ ‘No, I’m not,’ he shot back, ‘I have a problem.’ So that is how this cute kid defined himself – David with ADHD which is a problem. It saddened me to think how his parents and teachers had missed a great opportunity to help him think of himself as, ‘David, with special talents. 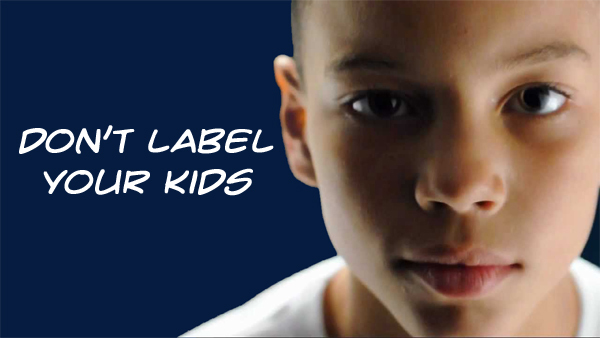 Read on to find out why labels for kids are a mistake and how to be Label-Free. Kids internalize the label that is projected onto them. They begin to become the label – it becomes a self-fulfilling prophecy. They say something like, ‘Sam’s the clumsy one.’ And, from the moment that Sam is labeled as ‘the clumsy one’, being clumsy becomes what he does best. Positive labels will, of course have the same effect. So when Jenna’s parents say, ‘Jenna’s the creative one in the family,’ this gives Jenna license to do wonderfully creative things. Here’s how powerful labels can be. New findings from a team of researchers from the California Institute of Technology (Caltech) and four other institutions shows that attributing higher status to someone in a group, such as ‘high achiever,’ can actually increase their IQ scores! We have, unfortunately, also seen how negative labels used to describe others, especially on Facebook can destroy the self-esteem of children and even cause suicide. The fascinating aspect of this is that a label has the power to influence the child’s biochemistry. Children who carry negative labels in their heads will often have high levels of stress which triggers unhealthy stress chemicals. These chemicals will hamper their ability to learn, feel good and be healthy – which then reinforces the label. Positive labels, on the other hand, stimulate positive and healthy chemicals, which give the child the ability to achieve positive and healthy things. Doctors, teachers, parents and, even the children themselves, need to become aware of how dangerous labels can be. I am particularly concerned about the long list of learning, mood and behavioral diagnostic labels that doctors are slapping on children. Parents, please Take Charge of this destructive practice. Do not let the doctor’s labels define your child or the way you interact with your child! 1. Make the decision to drop the label. Never use it in any conversations, don’t allow it to influence your thoughts, beliefs and feelings about your child. Forget that you heard it. 2. Identify 7 positive characteristics that make your child special. For example, David is imaginative, reliable, kind, thoughtful, good with numbers, energetic and funny. This doesn’t mean being in denial about your child’s challenges. It simply means that you are focusing on the specialness of your child while doing what needs to be done to help the child overcome the problems. Notice these 7 characteristics whenever the child displays any of them. Enjoy them. Feel good about them. Smile when you see them. Talk about these characteristics to the child and others. Be grateful for these characteristics. Make the child aware of his specialness when you see any of the 7 characteristics. What we think, thank and talk about we bring about. Dr. Sandy Gluckman is revolutionizing the care of children by offering a medication-free approach to the treatment and prevention of learning, behavior and mood disorders that is grounded in the most up-to-date, scientifically-proven information.